Authors: G. Chauvin, S. Desidera, A.-M. Lagrange, A. Vigan, R. Gratton, et al. Taking a picture of an extremely faint planet next to a bright star is exceptionally challenging, both due to the difficulty of the observations and the rarity of planets at wide separations. So, when a new planet is imaged, it makes waves in the community. HIP 65426 b is the first planet discovered with the Spectro-Polarimetric High-contrast Exoplanet REsearch (SPHERE) instrument on the Very Large Telescope (VLT) at Paranal Observatory in Chile. You may remember a paper published last year about a planet in a triple system discovered by SPHERE. Unfortunately that object is most likely a background star (paper), making HIP 65426 b the first planet discovered by SPHERE. Figure 1 shows the discovery image. Figure 1: Image of HIP 65426 b at 1.6 μm. HIP 65426 is located at the center of the image, behind the coronagraph, while the planet is located to the lower left. Figure 1 in the paper. SPHERE is part of a new generation of extreme adaptive optics instruments, along with GPI (Gemini Planet Imager) and SCExAO (Subaru Coronagraphic Extreme Adaptive Optics), capable of imaging planets. These new instruments use a combination of laser guide star adaptive optics, to remove distortion caused by the earth’s atmosphere, coronagraphs, to block out the light of the primary star, and integral field spectrographs to not only take images but also spectra of their targets. All of this, combined with complicated image processing techniques (such as LOCI and PCA), allow the discovery and characterization of fainter planets orbiting closer to their host stars. HIP 65426 b was discovered 830 milliarcseconds from its host star HIP 65426. To put that separation into context, 830 milliarcseconds is the size of a human hair at a distance of 25 meters, or just under 2 inches at the height of a passenger jet. Using the distance to the star measured by Gaia, this separation converts to a projected separation axis (since we do not know the inclination of the orbit) of 92 au. Using the age of the star (~14 Myr derived from nearby cluster members) the authors fit the spectrum of the planet and found it to be 6-12 Jupiter masses with an effective temperature of 1300-1600 K and a radius of ~1.5 Jupiter radii. This places HIP 65426 b in a range of parameter space particularly interesting in the study of cloud formation in giant planets and brown dwarfs. 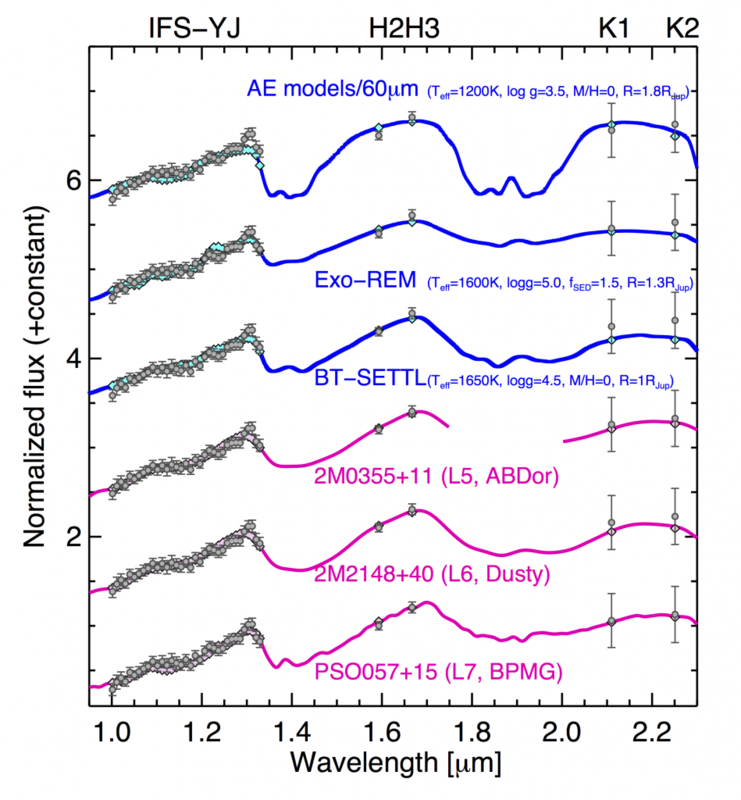 Figure 2 shows a comparison of the observed spectrum to model atmospheres and observed brown dwarfs of similar mass and temperature. Figure 2: Spectrum of HIP 65426 b (in grey) compared with the best fit atmospheric models (in blue) and observed spectra of brown dwarfs (in pink). The data matche a fairly wide range of temperatures and radii due to different cloud properties. Notice how the models differ significantly in the regions where there are no data points. Figure 3 in the paper. HIP 65426, an A2 star in the Lower Centaurus-Crux association, is by no means a normal star. It is one of the fastest rotators known for its spectral type, rotating with a period of ~3.24 hours. HIP 65426 also does not appear to have a debris disk, common around young stars. 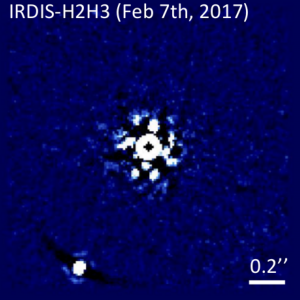 Many other directly imaged planets are found in systems hosting debris disks (e.g. Fomalhaut b, b Pictoris b, and 51 Eridani b to name a few). The absence of a disk may be a clue in the mystery of how HIP 65426 b formed. It would be very difficult to form HIP 65426 b via core accretion given the planet’s mass and distance from the star. An intriguing hypothesis proposed by the authors is that the planet did form via core accretion (though much closer to its host star) and was scattered to a wider orbit by a close encounter with another planet. This hypothesis could also explain the star’s extremely fast rotation if the second planet spiraled into the central star, increasing its angular momentum. If this were the case, HIP 65426 b would likely be on an eccentric orbit which could be tested with further monitoring of the system. It is also possible that the planet may have formed by gravitational instability in the disk or turbulent fragmentation of the molecular cloud as an extreme binary system. More detailed studies of the composition of the planet’s atmosphere will help explain how this planet formed. As always, further observations are needed to understand this curious system. HIP 65426 b and future discoveries with the new generation of exoplanet imagers will shed light on the complex transition between massive planet and extreme-mass-ratio binary formation. Sam Factor is a 4th year Ph.D. candidate at The University of Texas at Austin studying direct imaging of extrasolar planets and low mass binary stars. He uses an interferometric post processing technique to allow the detection of companions below the diffraction limit of the telescope. An Overview of the Extreme Solar Systems III Conference Is there anything out there? A search for the widest separation planets Double Sunsets: Are there Planets orbiting Binary Star Systems? Where do most planets form? Picking nits, but it’s a projected separation, not a projected semimajor axis. You are absolutely correct! We only see what the separation is currently and need to fit the orbit to get the semi-major axis. Thanks! I am curious about the planetary ‘effective’ temperature quoted as 1300*K-1600*K at a separation of 92 Au from the central star and an age estimated as 14M years. Could the reviewer comment, please? Direct imaged planet, like this one, are very young and are still warm due to it”s formation. (They start warm and cool down with time). They use cooling model to compute the effective temperature from the age and the luminosity of the planet. (It’s not an equilibrium temperature). Many thanks although I had spent what felt like half a day searching for just such a ‘cooling model’ or any paper with a time v temperature plot on a millennia scale but found nothing listed. I had thought that with an “early” formation time, from 0 to ~10M years, temperature would be well below the 1000K level? Any references, please?